Whilst there are other engine types (such as rotary and electric), only two-stroke or four-stroke engines are covered in this section as most motorcycles in the world use this technology. A stroke refers to the full travel of the piston along the cylinder, in either direction - up is one stroke and down is another stroke. 4 strokes (up, down, up, down). Intake - The fuel/air mixture is first drawn into the crankcase by the vacuum that is created during the upward stroke of the piston. 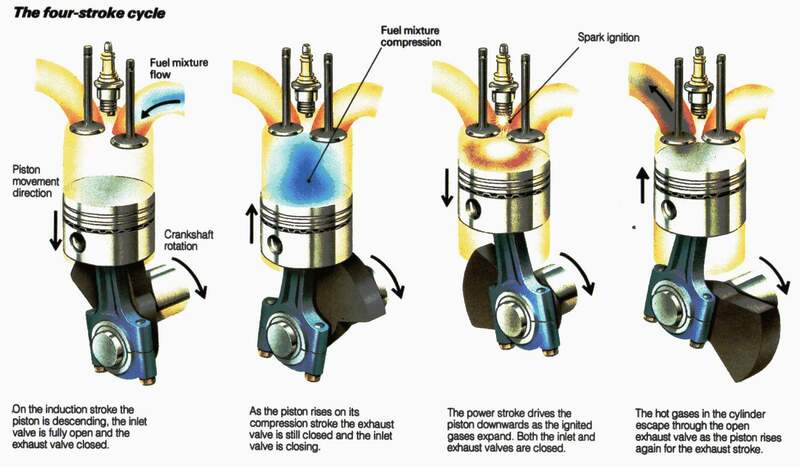 Crankcase compression - During the downward stroke, the valve is forced closed by the increased crankcase pressure. 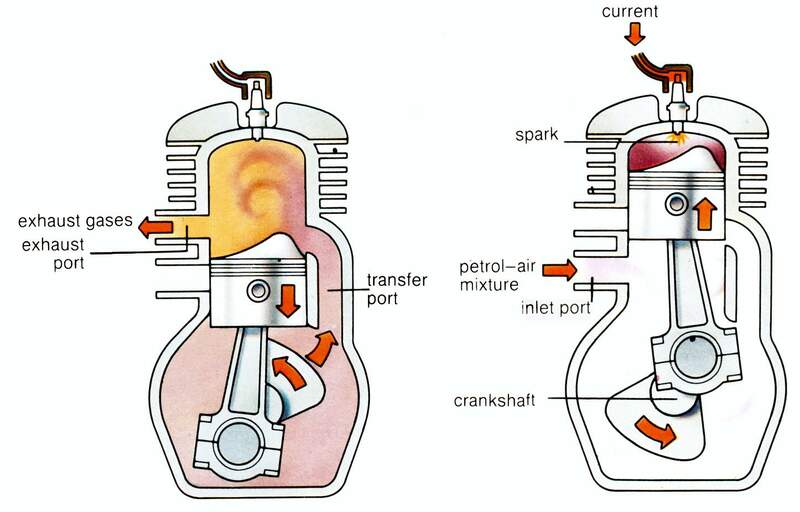 The fuel mixture is then compressed in the crankcase during the remainder of the stroke. Transfer/Exhaust - Toward the end of the stroke, the piston exposes the intake port, allowing the compressed fuel/air mixture in the crankcase to escape around the piston into the main cylinder. This expels the exhaust gasses out the exhaust port, usually located on the opposite side of the cylinder. Unfortunately, some of the fresh fuel mixture is usually expelled as well. Compression - The piston then rises, driven by flywheel momentum, and compresses the fuel mixture. (At the same time, another intake stroke is happening beneath the piston). Since the two stroke engine fires on every revolution of the crankshaft, a two stroke engine is usually more powerful than a four stroke engine of equivalent size. This, coupled with their lighter, simpler construction, makes the two stroke engine popular in chainsaws, line trimmers, outboard motors, snowmobiles, jet-skis, light motorcycles, and model airplanes. Intake - The stroke of the piston begins at top dead center. The piston descends from the top of the cylinder to the bottom of the cylinder, increasing the volume of the cylinder. A mixture of fuel and air is forced by atmospheric (or greater by some form of air pump) pressure into the cylinder through the intake port. Compression - With both intake and exhaust valves closed, the piston returns to the top of the cylinder compressing the air or fuel-air mixture into the cylinder head. Power - This is the start of the second revolution of the cycle. While the piston is close to Top Dead Centre, the compressed air–fuel mixture in a gasoline engine is ignited, by a spark plug in gasoline engines, or which ignites due to the heat generated by compression in a diesel engine. The resulting pressure from the combustion of the compressed fuel-air mixture forces the piston back down toward bottom dead centre. Exhaust - during the exhaust stroke, the piston once again returns to top dead centre while the exhaust valve is open. This action expels the spent fuel-air mixture through the exhaust valve(s). Primarily used in smaller motorcycles where torque is more important that horsepower and top speed such as in Dual-Sports, Dirt Bikes, Motocross. On the down-side single cylinder engines cannot produce high enough rpm and subsequently not enough power and top speed. Due to the single cylinder it tends to produce more vibration. It's all in the name: the two cylinders are horizontally opposed to each other. As each cylinder has opposite strokes in theory (at least) the engine should vibrate less. Opposing twins (or also referred to as Boxers) are very popular with BMW and on its big adventure tourer, the GS, has become legendary. (BMW has over the years added counter balancers to reduce any vibration further). Similar to the Boxer twin, but obviously with two cylinders each side. Boxer Four engines has become very rare as manufacturers opted for inline four cylinders. Most likely the smoothest of them all - the Boxer Six. However they are very expensive to manufacture and maintain and are very heavy - but the ultimate super long distance touring engine. Only used in very large engines, typically 1500+. Honda is the only manufacturer still making use of the Boxer Six in the Gold Wing GLX 1800.